The Sheckler Foundation has proudly named the top four finalists for its “Be the Change” initiative, a web-based program designed to support and give a voice to children, individuals and organizations in need. The top four finalists include: A Walk On Water, Books and Boards East Coast Tour, Fashion Honors Autism and Passport 2 Freedom. The finalist with the most votes by Tuesday, June 27, 2017 will receive support from Ryan Sheckler, the Sheckler Foundation, its SkateBOARD members and a $10,000 financial grant to help make its vision a reality. Meet the top four finalists and cast your vote here: shecklerfoundation.org/be-the-change. The Sheckler Foundation presents the top four finalists for its ninth “Be the Change” initiative, designed to help children, organizations and individuals in need. The top four finalists include: Adventure Club, Next Up Foundation, Nick’s Picks and Traveling Stories. The finalist with the most votes by tomorrow’s deadline – Tuesday, February 7, 2017 will receive support and a $10,000 financial grant from the Sheckler Foundation to help make its vision a reality. Watch the videos and cast your vote! Ryan Sheckler and the Sheckler Foundation joined Coping Mechanism at Parisite DIY Skatepark to celebrate the expansion of the first public skatepark in New Orleans’ history. It has taken Coping Mechanism two years to get Parisite DIY Skatepark legalized, but now it’s New Orleans’ first public skatepark – designed, built and run by skateboarders. Parisite DIY Skatepark was ready for its next build, but needed help with a crucial part of the skatepark: the coping. 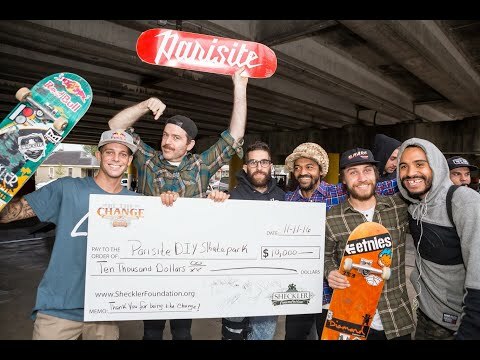 As the Sheckler Foundation’s 7th “Be the Change” beneficiary, Ryan Sheckler presented Parisite DIY Skatepark with support and a $10,000 financial grant to help implement quality steel coping and other metal work to create a public skatepark in New Orleans that will last decades.